With a goal of offering travelers a strong sense of place along with high quality food, beverage and merchandise offerings, the Tucson Airport Authority Board of Directors voted unanimously on Wednesday (September 21) to award contracts to new operators for new and expanded food and beverage as well as news, gifts and specialty retail concessions in the terminal. The new food and beverage concessions will be operated under a joint venture led by Creative Food Group LLC, New York, which will partner with Local Foods Concepts LLC. The new retail concessions will be a joint venture led by Hudson Group Retailers LLC, East Rutherford, NJ; Tucson-based Poravion LLC and Cambios y Servicios Inc., Phoenix. The approval follows the recommendations of four-member selection committees made up of TAA member representatives and TAA management. They evaluated two responses to a request for proposals for the food and beverage contract and four proposals for the news, gifts and specialty retail contract. The new agreements replace existing agreements with other concessionaires, which expire at the end of February 2017. The new agreement for the food and beverage concessions runs for 10 years with two one-year options. The new agreement for news, gift and specialty retail is for eight years with two one-year options. Under the new agreements travelers using the airport will see food and beverage options with local brand names including Beyond Bread, El Charro Café, The Maverick, Noble Hops, Sir Veza’s Taco Garage, Thunder Canyon Brewery and Arbuckle’s Coffee. The retail concepts will be redesigned and themed to capture iconic cultural influences of the Tucson region such as a traditional mercado and tienditas (small stores) and historic influences using works of local artisans. In addition to selling the usual travel necessities and newsstand items, the stores will offer local souvenirs, jewelry and sports gear. Plans include collaboration with the nationally-known Tucson Festival of Books. “Travel has changed with the new security requirements and passengers are spending more time in airports looking for more and different things to do. This is the airport’s opportunity to showcase the many things that are unique to the southern Arizona region,” said Bonnie Allin, President and CEO of the Tucson Airport Authority. As part of the new agreements the concessions are agreeing to “street pricing”, meaning their products at the airport shops will be priced the same as at their other locations. On the food side, the local brands will be intermingled with growing national brands including Bruegger’s bagels, BUILT Custom Burgers, Dunkin’ Donuts and Pie Five Pizza. As part of its local outreach, Creative Food Group has already partnered with Flores Concepts LLC, owned by Raymon Flores, founder of Sir Veza’s Taco Garage and whose family operates El Charro Café, and worked with FORSarchitecture+interiors design group, whose projects have included Fox Restaurant Concepts locations, Janos Wilder’s Downtown Kitchen+Cocktails, The Hub and Tavolino Ristorante Italiano. The company will use Tucson-based Canyon Building & Design to do the buildout of the concession locations. Creative Food Group was founded in 2007 and currently has airport operations at Baltimore-Washington, Boston Logan, Newark Liberty, Midland International in Texas, Lexington Bluegrass Airport in Kentucky, Syracuse Hancock in New York and in August was awarded a contract at Tulsa International. For the retail concessions, Hudson Group plans to open the Arroyo Trading Post, including Agustín Kitchen Express, in the Centre Pointe area of the ticketing level. This pre-security full-service travel convenience store is intended to be a gathering place for all kinds of airport users; travelers, friends and family and meeters and greeters. Post-security retail options on the concourses will include stores named Hudson Gates Pass and Hudson Fort Lowell, both of which will offer a variety of reading materials, local gift and souvenir items, and travel necessities. Hudson Gates Pass will also feature technology and electronics and will have Arizona sports gear. On Concourse B, Ink by Hudson will feature an eclectic selection of gifts, stationery, toys and other items in addition to a wide array of new and best books, favorite classics and hidden gems. Along the two concourses where the TSA checkpoints are currently located, Hudson has developed new concepts for specialty retail. On the A Concourse they will be called Tucson Tienditas (small shops) and include Arizona Sports Zone, selling sports gear and Mast, a new Tucson-based woman-owned business selling designer jewelry, handmade leather goods and home goods. Other retailers on the concourse will be See’s Candies and Kids Works. The B Concourse will have Mission Marketplace, designed as a street market featuring lifestyle items including a shop named Spirit that will focus on Native American and Western items. There will also be a Belkin electronics store and Sunglass Icon, offering styles and name brands to suit every taste, need and budget. Founded in 1987 as an outgrowth of a 69-year-old newspaper distribution company, Hudson Group is North America’s largest airport retail operator with locations in 70 airports in the U.S. and Canada. Construction on the new concessions will start March 1, 2017 and is scheduled to be completed in phases though the end of 2017. Arroyo Trading Post With Agustín Kitchen Express – A full-service convenience retail store intended to serve all airport users, whether traveling or not. Retail options will be laid out in four distinct areas: Tucson-centric featuring locally made and branded souvenir-type items; news and media; travel essentials; and a marketplace with fresh and pre-packaged grab-n-go and snack items. This location will also offer self-service coffee and fountain soft drinks. 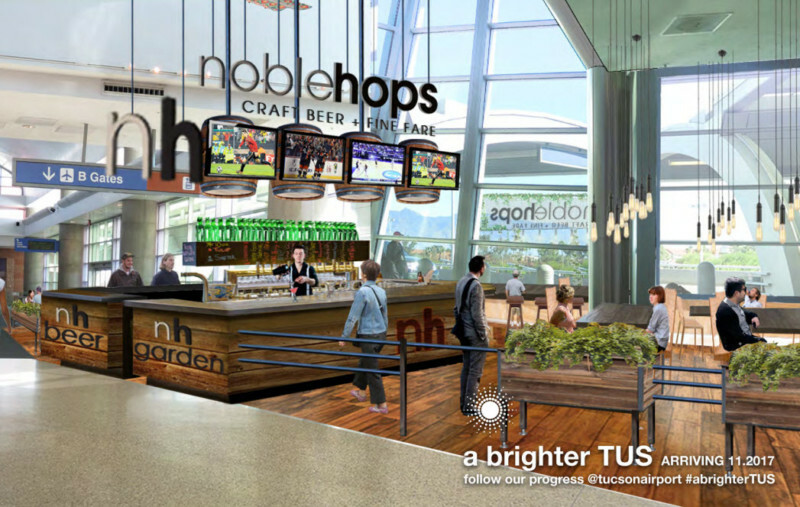 Noble Hops Craft Beer+Fine Fare Beer Garden – Brothers Aric and Joshua Mussman will bring their Oro Valley gastropub to the airport in an area that will be redesigned to open up to the outdoors in front of the terminal and take advantage of the views north to the Santa Catalina Mountains. Beyond Bread – This, along with one in Concourse B, will become the fourth and fifth locations for the Tucson-based bakery and café established in 1998 offering some of Tucson’s favorite pastries, sandwiches and salads. Dunkin Donuts – The airport location will feature the same donuts, coffee and fare found at its traditional locations. Hudson Gates Pass Featuring Destination Tucson and Tech On The Go – Similar to the Arroyo Marketplace pre-security, this retail store will have locally-made items, a news and media area, traveler essentials and snacks, with the addition of an area specializing in travel technology and electronics items. Pie Five Pizza Co. – A custom pizza concept that works well in an airport environment due to its development of an oven that can cook its pizzas in less than two and a half minutes. Sir Veza’s Taco Garage – The Tucson-based chain will bring its unique bar setting mixed with modern takes on traditional and street Mexican food, including its own Sonoran-style hot dog, to the airport. Tucson Tienditas – Four small retail kiosks selling specialty items: Arizona Sports Zone, which sells locally branded sports gear; Kids Works, selling children’s toys and games; Mast, focused on locally made jewelry, leather goods and similar items, and See’s Candies. The Maverick – The airport location will mimic Tucson’s popular western-themed Tanque Verde Road location with a full bar, selected menu items and a stage for periodic live music performances. Beyond Bread – This, along with one in Concourse A, will become the fourth and fifth locations for the Tucson-based bakery and café established in 1998 offering some of Tucson’s favorite pastries, sandwiches and salads. Bruegger’s – This regional chain with a strong presence in the Tucson area will offer its fresh-baked, genuine New York-style bagels, real Vermont cream cheese, sandwiches and custom roasted coffee. BUILT Custom Burgers – Serves build-your-own burgers using antibiotic and hormone-free Angus beef, natural turkey or chicken or a homemade vegan patty with a choice of buns and toppings along with fries, soft drinks and shakes. Hudson Fort Lowell Destination Tucson and Arizona Sports – Similar to the Arroyo Marketplace pre-security, this retail store will have locally-made items, a news and media area, traveler essentials, and snacks, with the addition of an area featuring Arizona Sports gear. Ink – A bookstore, with additional areas containing gifts, stationery, toys and other items, that will take advantage of Hudson’s long history in this retail category. The company will become a sponsor and help in gaining national exposure for the annual Tucson Festival of Books. Mission Market – Three retail kiosks in a street market setting selling specialty items: Belkin electronics, Sunglass Icon and Spirit, which will specialize in Native American and Western-themed items. Thunder Canyon Brewery – A pioneer in Tucson’s craft brewery scene, this third location will have a full bar and brewpub-style food. Arbuckles’ Coffee – With a history that dates back to two brothers in the post-Civil War era, this company was revived in Tucson in 1974. The revival now includes a selection of varietals and roasts as well as Ariosa Blend, which was first made in 1864 and is still known as the Original Cowboy Coffee. Avanti Market (Ace Vending) – No matter the time of day or night, this “micro market” will be “open” selling a variety of food and drink items. Using technology, customers scan and pay for their own items. Inventory is constantly monitored and stocked and can be adjusted based on demands and customer preferences.